Home/News/Lions and tigers and bears, oh my! Petaluma’s main street hadn’t seen such a cavalcade of animals since the circus parades came to town in the early 20th century. Then earlier this month, a large rental truck pulled up in front of the Sienna antique collective and parked in the middle of the street. 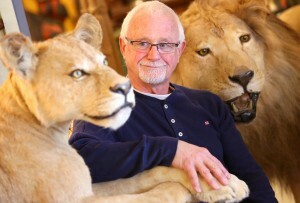 It was delivering a collection of at least 35 lifesize taxidermied animals and heads to antiques dealer John Fornachon. That day the Boulevard was crowded by passers-by who did double-, even triple-takes at what they were seeing. Shoppers paused to ogle and whip out their cell phone cameras. Even a small dog in a red truck got into the action from the passenger seat, growling and barking furiously at these alien invaders. 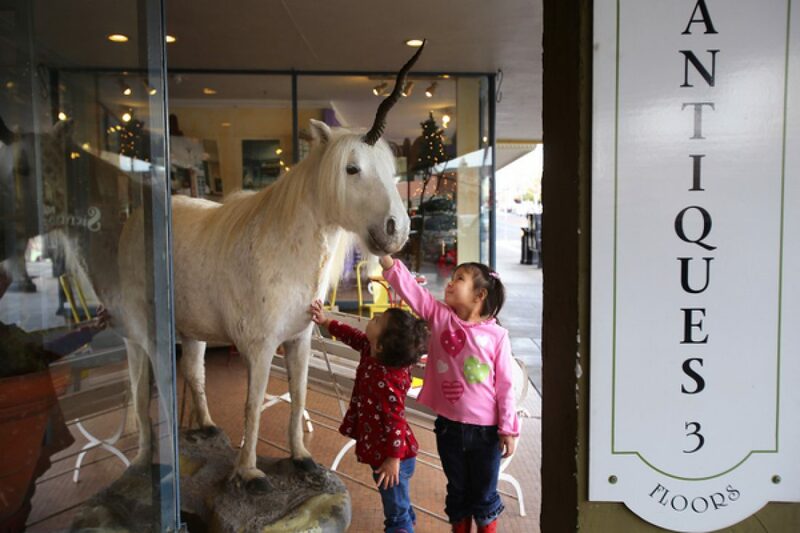 The zebra was part of a natural history museum created 50 to 70 years ago by a taxidermist in southern Alabama. When the man died, his widow, in her late 80s, felt it was time to sell the collection. “I didn’t know what to expect,” Fornachon said. But what he found so delighted him that, instead of buying only the zebra, he bought all the animals. .
Sienna Antiques co-owner John Fornachon with two taxidermy lions on display at his Petaluma store. “It would have cost me $250 for a crate and about $800 for shipping, so I flew back and rented a truck,” Fornachon said. The collection includes lions, tigers and bears, plus an ostrich more than 6 feet tall, a musk ox, various graceful antelopes and gazelles, a massive Cape buffalo, a dik-dik, an eland, fish and elk. Some of the elk are so large their antlers had to be detached for shipping. There are also taxidermied heads, including an elk head that fellow dealer Jim McCormick described as among the finest he had ever seen. All the animals except a king cobra were once real. Fornachon said the taxidermist, whose name he preferred not to mention, bought the animals from zoos after their deaths. The menagerie is by far the “craziest thing I’ve ever seen,” he said, and the quirkiest collection he has ever bought. All the new inhabitants of the Sienna “zoo” are for sale except for the lions, which have already been sold to a private collector. Prices begin at $900. And yes. The collection does include a unicorn and a saber-toothed tiger. Are they real? You be the judge. Sienna Antiques is located at 119 Petaluma Blvd. North, 763-6088, siennaantiques.com. 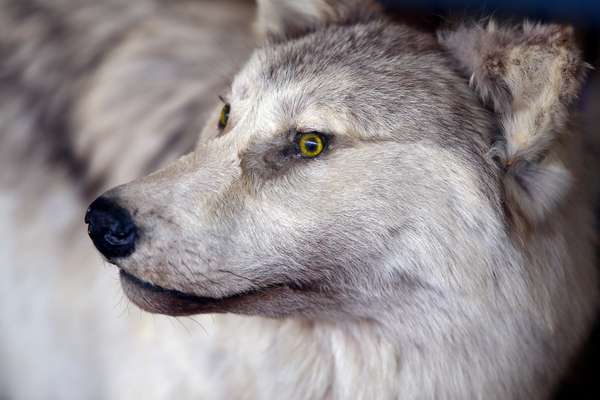 A stuffed Alaskan wolf from the Sienna Antiques collection.